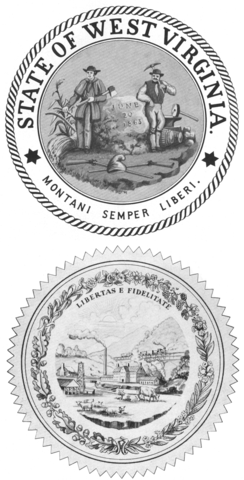 In 1863, he was commissioned to design the Great Seal of West Virginia. To symbolize the state’s economic potential, he drew a farmer and a miner standing beside a rock with the state’s founding date. His state seal remains one of the most iconic and recognizable images from West Virginia history. Then, for seven years, as commissioner of immigration, he recruited immigrant workers and landowners to the state. Diss Debar died in Philadelphia in 1905 at age 84. Today, many of his historic drawings are in the collections of the West Virginia State Archives.